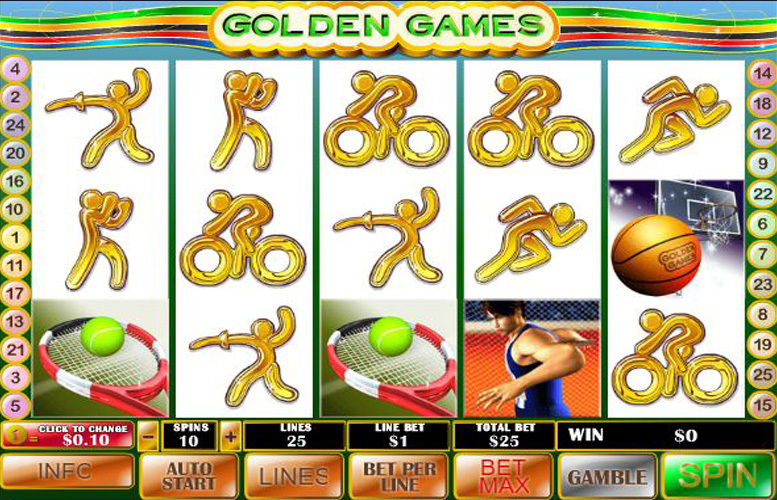 Paying tribute to the Olympics and sure to appeal to anybody who loves the festival of sport that occurs every four years, Golden Games is a five reel, three row and 25 payline slot with a theoretical return to player percentage of 94.03%. Whilst not quite boasting as many features as the Olympics does events, Golden Games does include a number of extra elements to keep things interesting. Those include wild substitutions, scatter wins and generous free spins which are subject to an awesome 2x multiplier. The slot’s fun and unique theme is sure to appeal to all those players who also love their sport. A top payline jackpot which can be worth £500,000 is one of the most generous you will find anywhere. Players of all budgets are well catered for, with stakes per spin of between 25p and £1,250 able to be chosen. Wild substitutions, scatter wins and free spins help to boost the winning potential of the slot still further. As a slot with an Olympic theme, players would be forgiven for expecting there to be a bonus game, but that is unfortunately lacking with Golden Games. Graphics and imagery, too, are a little pedestrian. Whilst at the Olympics it’s all about going for gold, when you’re playing Golden Games what you want to see are five matching symbols line up consecutively from left to right along one of the game’s paylines. The best five symbol combination of all is one comprising five of the game’s gold medal wild symbols. If a player sees that particular combination appear after a spin, they will be rewarded with a jackpot worth 10,000 times their chosen bet per spin. The highest possible line bet stands at £50, meaning that the top jackpot is £500,000. 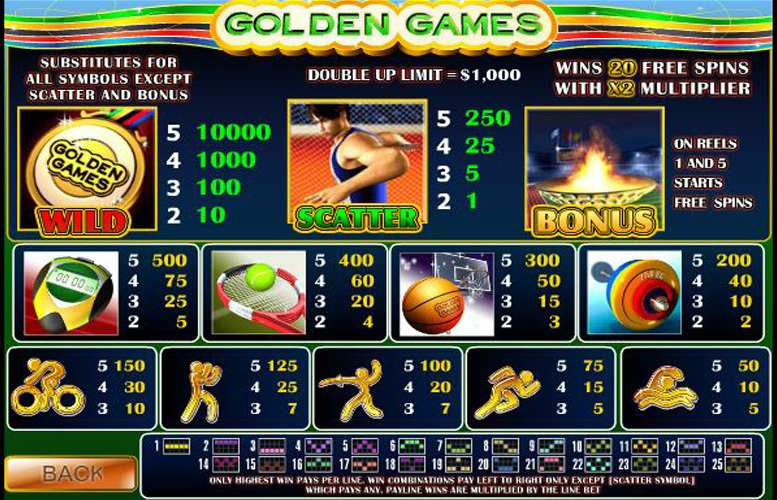 In order to add both winning potential and extra interest to the slot, Golden Games includes a handful of additional game features. These are namely wild substitutions, scatter wins and free spins. Depicting a gold medal, the Golden Games wild symbol can appear anywhere on the reels and stands for all other symbols apart from the scatters and bonus symbols discussed below. When the wild does perform a substitution it is in order to make up the most valuable possible payline combination. The Golden Games scatter symbol shows off an image of a discus throwing athlete and can also appear on any reel. If two or more of the symbols appear after a spin, a player will receive an instant win linked to how many scatters there are. The third and final special symbol included on the Golden Games reels is a bonus symbol featuring an image of the Olympic flame. If that symbol appears on both reel one and reel five, fully 20 free spins are immediately triggered. All of those free spins are subject to a beneficial 2x multiplier, but there is a £1,000 double up limit applied. All of the symbols on the Golden Games reels are sports themed, and the regular symbols feature either images of sports equipment or silhouette style designs representing different sports. It is the sports equipment symbols that are the most valuable regular symbols and which can trigger the best payouts. The stopwatch symbol is the most valuable regular symbol of all and triggers a jackpot worth 500 times the line bet if five line up along an active payline. Five of the tennis racquet or basketball symbols similarly arranged, meanwhile, result in payouts worth 400 times and 300 times the line bet respectively. If medals were handed out for the range of staking options that slots provide to their players, Golden Games would certainly take home a gold. Players of the slot can, after all, bet anywhere between 25p and £1,250 per spin. In order to alter their stake amount, Golden Games players are able to choose how many paylines to have active, how many coins to bet per payline and how much those coins can be worth. Anywhere from one to 25 paylines can be activate, anywhere from one to ten coins can be bet per line and those coins can be worth between 1p and £5. Themed for a sporting event that rewards excellence, it’s only fitting that Golden Games is a truly brilliant slot game option which most players are sure to love. The slot, after all, excels in terms of its top jackpot size, features which boost winning potential and range of staking options. That top jackpot stands at an impressive £500,000, which is not only a life-changing amount of money but is also far higher than the best payouts provided by most other slots. Other winnings, too, can be enhanced and supplemented by wild substitutions, scatter wins and free spins. Able to appeal to players of all budgets, too, Golden Games also boasts one of the broadest ranges of possible stakes per spin. The only slight weakness of the slot, therefore, is the lack of a bonus round or side game.